To say I’m thrilled about my book, HEART'S DESIRE, being made into a movie is an understatement. I’m blessed and so very appreciative to all the people who have worked for over four long and arduous years to make this happen. In the movies, the heroine (me) would get a phone call and someone (the publisher) would announce that Hallmark just bought my book. That’s the dream scenario. That’s not what happened. The behind the scenes story, like most things in life, was bittersweet. 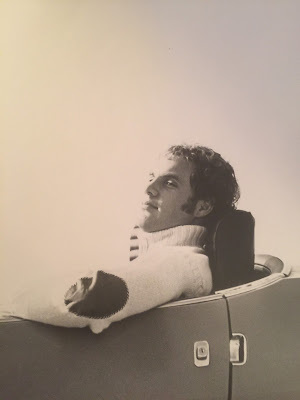 My late husband, Jed Nolan, was a film producer, which some of you may or may not know. 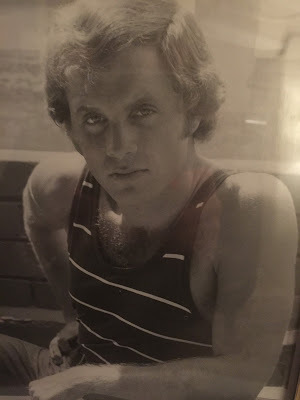 For nearly 15 years we worked seven days a week writing, re-writing, pitching studios, television networks, cable networks, talking to agents, managers, stars, other producers. You name it. I felt I’d walked over every inch of asphalt in Hollywood. We never got a bite. Oh, we had several accolades. Quite a few production companies we partnered with and wrote, long, long, legal and expensive contracts with ended up stabbing us in the back. But we never gave up. We had delay after delay. In the process of all this, Jed became very ill and died. Jed made me promise that I would never give up on his dream for me—to get my Heartwarming books to television. I promised him and kept at it. After all, I actually do believe that deathbed promises are sacred. In addition, this promise is important to the rest of the story I’m going to tell. A year later, I signed the contract with my production company and Hallmark. Then there was a writer’s strike in LA. The production that was slated for last June got pushed to November. Then December. Now, it’s the end of January, but it’s finally happening. On January 29th, I’ll be flying to Vancouver and I’ll be on the set, having promotional photographs taken. 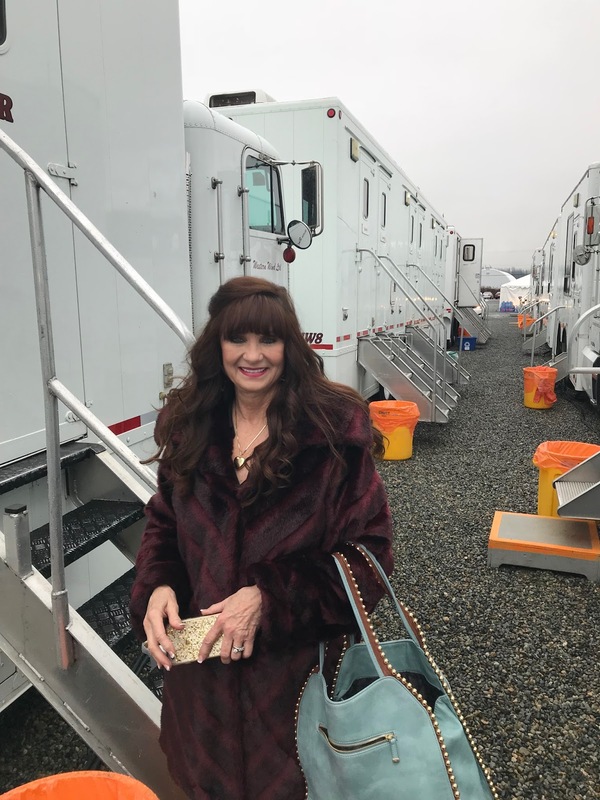 I’ll be staying in the motel with all the cast and crew. For me, it will be somewhat like the film shoots I visited when Jed was producer and/or director. It’s a lot of fun, but seriously, between us, I was always looking around for my laptop so I could get some pages written. I know, is that nutty or what? Every day there is something new and exciting that has happened, besides changing my flights! And all of it is wonderful. But here is the story within the story. For two plus years I have put one foot in front of the other hoping to make good on my promise to Jed. I have asked the producers to dedicate the film, “In Memory of Jed Nolan”. They’ve said they will do this on the end scroll. Whether it makes it past the cutting room or not, is in God’s hands. But I’ll be fighting for it all the way. I have to back up a bit. Years before Jed died, he and I built a storage shed in the back yard. There was a five drawer file cabinet that we put all his film files and old PR photos about him. This was his “space”. 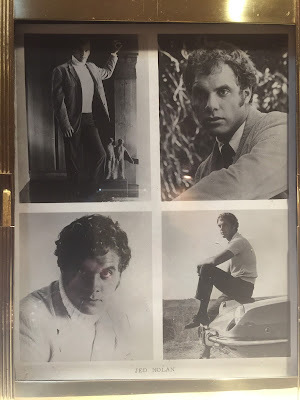 There were three 8x 10 photos of him when he was 19-22 years old that he used for acting gigs or modeling assignments. When he died I went through every single file in that cabinet looking for those photos. I wanted to put them in the Memorial Pamphlet I gave to our friends. For the life of me, I never found them. Since that time, every time I would go to the shed, I would rifle through the files looking for those photos. Last week, I got a spectacular call from the producers. I’m not allowed to disclose the content of that call, but let me say, I was dancing around the room. The best news I’ve heard in a long time. I thanked God, Jesus and told Jed I knew he was around me and he was helping to make this happen. I asked him if he would send me a sign to let me know that I was right and had fulfilled my promise. My friend came over to help me put the decoration bins in the shed. While she went back for another load, I stood in the shed next to the file drawers and thought, “I’m going to open this drawer and those photos will be right there.” I yanked open the drawer and a file wafted open revealing all three photos. Right where they should have been, but had not been for years. I burst into tears and laughed with joy. I’m still keeping my promise, Jed. I will never give up. Some of you may remember that HEART'S DESIRE was featured on the USA TODAY HEA blog with an in depth interview when it released in 2014. That interview revealed a lot about my writing journey, including my days on set with Kathleen Turner and Michael Douglas for Romancing the Stone. You can read the interview HERE if you missed it! Please join me on my Prism Book Tour for Heart’s Desire. The movie air date is March 17th, St. Patrick’s Day, which is the beginning of their SPRING FLING promotion. There will be lots of ads about our first Heartwarming book made into a film. Me at hair and makeup before my interview...all done! Standing with steamy men :). 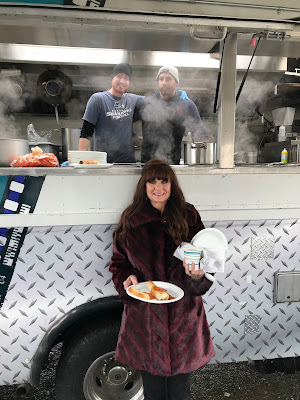 These two guys (Showthyme) fed the entire crew lunch every day! They were creative...the food was fabulous...and they were a hoot! Don't forget to mark your calendars for the tour date starting March 5th and the film debut airing March 17th, 9pm ET/8pm CT! It'll be a sweet and romantic St. Patrick's Day! Café owner Maddie Strong is finally ready to take her burgeoning cupcake business to the next level. With the help of handsome businessman Alex Perkins, her future's all mapped out. Until her first love comes home. At seventeen, Maddie adored Nate Barzonni with her whole heart and soul. But when he asked her to elope, she'd said no—she couldn't let him throw away his dream of becoming a doctor. Then he vanished from her life for eleven years. Now the cardiac surgeon has returned to Indian Lake asking for a second chance, and Maddie has to choose between her new life…and the man she never stopped loving. 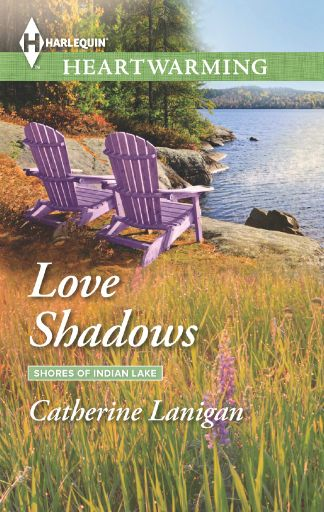 Catherine Lanigan is the international bestselling and award-winning author of over forty-five published titles in both fiction and non-fiction, including the novelizations of Romancing the Stone and The Jewel of the Nile. Ms. Lanigan’s novels have been translated into over twenty-four languages. Lanigan was tasked by the NotMYkid foundation to pen a collection of compelling and informative true stories of teen addicts. 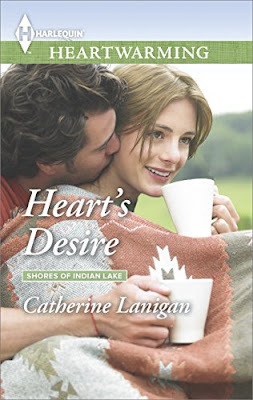 Ms. Lanigan’s SHORES OF INDIAN LAKE series for HARLEQUIN HEARTWARMING includes LOVE SHADOWS, HEART’S DESIRE , A FINE YEAR FOR LOVE, KATIA’S PROMISE, FEAR OF FALLING, SOPHIE’S PATH, PROTECTING THE SINGLE MOM, FAMILY OF HIS OWN, HIS BABY DILEMMA, TOO CLOSE TO THE FIRE (2018) and MY RACING HEART (2019). The Hallmark Channel will air HEART’S DESIRE on March 17, 2018. Ms. Lanigan is a frequent speaker at literary functions and book conventions as well as inspiring audiences with her real stories of angelic intervention from her Angel Tales series of books. She is an outspoken advocate for domestic violence and abuse and was honored by The National Domestic Violence Hotline in Washington, D.C. She has been a guest on numerous radio programs including “Coast to Coast” and on television interview and talk show programs as well as blogs, podcasts and online radio interview programs. She writes a monthly blog for Heartwarmingauthors.blogspot.com. Visit her at www.catherinelanigan.com, on Facebook, LinkedIn, Twitter@cathlanigan.com, Pinterest, Goodreads and Google+. You can find Heart's Desire and all of Catherine's books on Amazon or at your favorite online bookstore. You can also find her on Harlequin.com. This is so exciting, Catherine! A big congratulations to you. I've got my calendar marked! Me too, Jill! So exciting! What a wonderful and inspiring story, Catherine! It's funny you should mention Romancing the Stone--it's one of my favorites and is on my blog for this coming Thursday as a top pick romance film! Congratulations on your upcoming Hallmark Channel movie. What a dream come true! Amie, I LOVE Romancing the Stone and have the movie and the book! I have The Jewel of the Nile too :). Good morning! So after the snowfall this morning, I was so wishing I was back in Los Angeles where it was 81 degrees! Anyway, I'm still walking on air! Thanks, Jill! Thank you, Amie! Believe me, Romancing is STILL my GO TO movie when I'm depressed! But I'm so far from depressed now, I can't tell you. Save some hugs for me for Denver! I do production accounting, and accounting for production companies, so I've issued cheques to writers to option their work. It's nice to hear the other side, and man, are they turning that around quickly. Shooting in January, airing in March. Technology is changing, so post production is no longer a year long process! Congrats! Cool, Kim! I didn't know you do all that! It really is amazing how far tech has come. Wow, Kim...I didn't know either. Believe me, I was and am impressed with the technology on that set. What a learning experience those five days were! Thanks for stopping by. Oh my goodness what a story and what a journey! Congratulations! Oh, that part about Jed and finding the photos in the drawer...goosebumps! Incredible. Catherine, I'm so over-the-top excited for you and can't wait to see the movie!! I love Hallmark movies (okay, so my kids say I'm addicted to them) and I've read your Shores of Indian Lake series and loved every story. This is going to be the sweetest, best St Patty's Day ever! Movie night/party!! And your birthday party, right???? So isn't that exciting? I'm just so thrilled for you!!! And I'm literally sitting here with tears rolling down my face because your story is just so beautiful. I'm so glad you found those pictures! You are truly an inspiration to all of us. LeAnne, she moved me to tears too. 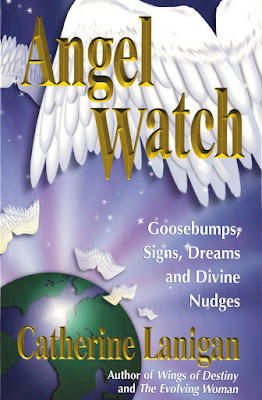 Catherine's Divine Nudges and Angel Watch series are filled with incredible real life stories like that. Everything she writes gets to the heart. And I still remember craving gourmet cupcakes for an eternity after reading Heart's Desire, so when I saw the photo above with the bakery set up in the background, I got so excited! Everything looks so mouth watering. Come to think of it, any movie watch party on March 17th should have a cupcake theme!! Really...you don't have to twist this sugar addict's arm lol ;). LeAnne, you are a true kindred spirit. There are even more Jed stories about Los Angeles. I have been in tears a lot during this whole experience. I am so very humbled and grateful to God for this experience. It was a long, long time, but I never lost faith. And neither did Dianne Moggy or my team at Harlequin and especially Lissy who has been with me through thick and very thin, lean years. But my DESIRE to write is in every facet of my DNA. Thanks for being there for me. AND Rula, NO ONE got to even THINK about a smidge of that frosting. Congratulations, Catherine! What a wonderful story all around. I'm so glad the pictures "turned up." You go, girl!! Was that incredible or what? Jed's definitely looking out for her ;). Can't get more romantic than that. Jed is always around me. He's a very active "angel/spirit" on The Other Side. Honestly, I SHOULD write an entire book on his angelic interventions since his death. Okay. I'm crying. Moving on. Such a wonderful story Catherine, that in itself would make a great movie. I admire your determination and perseverance. You never gave up! Kudos!! Janice, a movie about Catherine's life would be nothing short of AMAZING and inspiring! I am so happy for you, Catherine, and for Jed! I can't wait to see the movie! Your story--the real one--was just lovely to read. I'll be Jed is doing some happy dancing. Congratulations, Catherine! What an amazing story of perseverance. It'll make watching the movie all that much sweeter, knowing you got your HEA! I so agree with you, Jeannie!! I'm so excited for you, Catherine! You've reminded us all never to give up! Your story touched me- so glad you found the pictures. 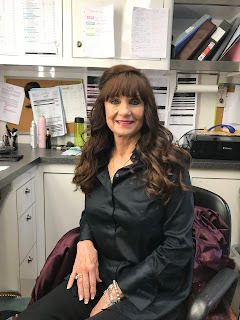 I will be watching on March 17th - like Rula I'm a bit addicted to Hallmark movies too, but this one will be extra special. I'm so excited, Cari! Can't wait to watch it!! Next month I'll be able to post some Hallmark "approved" photos. The set is magnificent. The lighting was so superior, the lights made this old chick look 30 years younger. Seriously. It was all magical. I've been addicted to their movies for years. Now, I'll be chained to the television. HA! Catherine, reading your story-behind-the-story is an emotional rollercoaster. You are a tremendous person. I'm so happy that you could keep your promise to Jed. I never thought of it like that, but you know what? Even Victoria said that to me a few years ago at RWA. She had a hard time keeping up with my personal story. Frankly, this blog is pitching my emotions all over the place. Love the photos of Jed in the rooster and finding the photos. I can hardly wait to watch the movie. Hi, Pam! Thanks. I put Jed's photo as my wallpaper on my phone and home computer. Then when I was on set, I showed his photo to just about everyone. The girls were like..WOW. Now that's a hunk. Your story is exciting and how wonderful you could fulfill this joint dream. As I said on your FB page, congratulations doesn't begin to cover the outcome of such a journey. Like everyone here, I'll be watching your movie! Virginia, THANK YOU! And tell all your friends to watch as well. It's really just so darling and the actors are like they walked right out of my book. The producers deserve so much applause. They did an incredible job. Today is the last day of the shoot. I'm praying for all of them. What a wonderful story. Very touching :) and :( at the same time. Thanks for sharing. Hi, Cathy! Thank YOU for coming by and commenting. SHARING is what ALL the Heartwarming authors are about. Such a fabulous sisterhood! My calendar is marked, and I can't wait to watch! I'm so thrilled for you, Catherine! What a beautiful testimony to perseverance, love, faith, and strength. CONGRATULATIONS!! Thank you, Marianne from both Jed and I. That's the thing. I've have certainly learned, never, ever to give up on your dream. Just because someone tells you "no" that's no reason to stop. Jed kept going until he died and even THAT didn't stop him. I'm just his conduit here on earth to see the dream materialize. This is so exciting. I'm happy your hard work finally went to fruition. I hope they keep their word on dedicating it to Jed. Hi, Roz! So do I. He would be so very happy. Sending you a big hug. Thank you, Anna! You are the best and I'm glad you were here to share this day with me as well. It means a lot. I love those photos, and I love even more the story behind them. I'm dancing with excitement, too. Congratulations, Catherine! Let's whirl around the room together, okay? There is still so much to do and so much going on. They finish shooting today and then we go to post. Thanks for being here today and spreading the word. Love your tweets! Carol...you are such a doll. I'm honored to know YOU! I have been so blessed by God to meet all my wonderful and talented Heartwarming sisters and then to live in the day of our emails, tweets and facebooks so we can keep up with each other and share our fabulous books with each other. Love to you! Thanks for the congrats. Your story has made my day! I am so happy for you and Jim. Wishing you even more movie contracts! Hi, Patricia! Glad to make your day. Isn't that something? You take care. Laurie, you are too, too kind. I SURE HOPE SO! I am so thrilled for you. I know it's hard, almost impossible, but sometimes impossible works. I'll be sure to watch the movie over and over again. My new favorite motivational quote! Hugs. So handsome, your Jed was. Hi, Laurie, and thank you so very much. Jed had such PRESENCE. When he walked into a room, he didn't have to say a word and everyone knew he was THERE. What an amazing story, Catherine! Just goes to show we should never give up on our dreams! I'm so happy for you and Jed. I know he's beaming down at you! Getting teary just thinking about it! A big congratulations to you! Awww. Thanks, Tara. I'm getting a bit weepy myself...he really is happy for me, for us! This is wonderful!! Can't wait for the movie. I just got a selfie from the kids on the set. They are wrapping tonight! Catherine, what a touching story behind the story! So happy for you and for Jed! I cannot wait to watch the movie! I know, me, too! What fun that will be. Think I'll be recording? I'm thinking YES! Hi, Awesome Amy! Remember when we did the radio show together? That was so much fun. Thanks for the lovely comments and for coming by. I hope you finished the book. I love your stories! Hello Catherine! Not sure you will remember me. Just watched a rerun of The Sweetest Heart on Hallmark and thought I caught your name on the beginning credits. Wanted to check it out. Had not seen your name since I learned of your doing the screen writing for Romancing the Stone. I enjoyed your dedication, mentioning a certain Nazareth College professor who pretty much told all of us we couldn't write! I believed him...obviously you did not! Congratulations on your success. I will have to look for your books! This is a great story! I'm sorry about Jed. I can't imagine how you do it everyday and kept writing through all the chaos. I'm submitting to a Harlequin editor and it has be nervous as ever. Cheers Catherine and God bless you! Loved this story! So glad I've discovered this group.